Are we to have two Vaughan Williams symphony cycles from the North-West of England? Sir Mark Elder and the Hallé have been quietly working their way through the symphonies and although I’ve not seen a formal announcement that a cycle is projected the inference is becoming ever more apparent. This Onyx release is expressly announced as the first issue in a complete cycle by Andrew Manze and the RLPO. I understand that it is planned to issue one disc per annum. Next up, in 2017, will be Symphonies 3 and 4 and since the final volume will couple the ‘Sinfonia Antartica’ and the Ninth in 2019, the release for 2018 presumably will comprise the Fifth and Sixth symphonies. Andrew Manze has been building something of a name for himself in VW’s music. He conducted the ‘Pastoral’ at the Proms in 2014 with great success (review). I myself heard him conduct a most impressive all-VW programme in Birmingham earlier that same year, including the magnificent Job - A Masque for Dancing (review). I believe he also conducted a programme containing the three middle symphonies at the 2012 Proms. I thought his reading of Job was very impressive. Though it doesn’t appear from Onyx’s schedule that there’ll be room for anything else in this series it would be great if Manze could also record Job since we need a new recording of that magnificent score. This will be the second time that the RLPO has recorded a complete VW cycle; they played for Vernon Handley’s excellent EMI Classics for Pleasure series in the late 1980s and early 1990s. The producer of all those discs was Andrew Keener and, by a pleasing piece of symmetry, he’s the producer of this new Manze disc also. By coincidence Handley coupled these two symphonies in his cycle, recording both of them in 1992 (review). I like both of these present performances very much. Andrew Manze shapes the Lento introduction to the ‘London’ Symphony very persuasively. Once he reaches the Allegro risoluto he establishes and maintains urgency and momentum from the outset; I approve of the way he ensures the accents count for something. When VW slows the pace and takes us into more ruminative stretches – for example at 8:41 – Manze guides the music with affection and sensitivity, obtaining refined playing from the RLPO. In that reflective passage Vernon Handley is just a fraction less inclined to linger and that’s true in similar episodes. It seems to me that Manze and the orchestra convey the spirit of the movement extremely well. The lovely Lento opens most auspiciously; the atmosphere is just right and the strings sing their melodies quite beautifully. 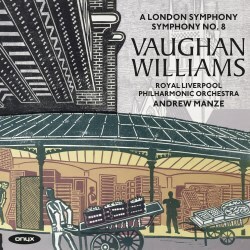 Manze finds the poetry in the music and the RLPO’s playing is very evocative and shows much finesse. The lavender seller/hansom cab episode comes off to perfection. The main climax is both warm and imposing and once it has died away the hushed closing pages are truly magical. There’s bustling energy in the Scherzo. Once again the orchestra is on the top of its collective game and the half-lights and subtle tints in VW’s imaginative scoring are realised very successfully. After the impassioned opening of the finale the sombre slow march is very well handled. The subsequent allegro is dashing before the March returns. Now Manze builds up the music – and the tension – so that the passionate tri-fold climax has great intensity. The Westminster chimes (8:15) herald the evocative epilogue. This is wonderfully done and it seems to me that Manze brings out the visionary side of the music. This epilogue is as hushed and finely-played as I can recall hearing on disc and it provides a most poetic ending to a most distinguished account of the symphony. The Eighth is another success. The RLPO deliver the interesting sonorities at the start of the first movement very well indeed. A little later (1:50 -2:50), the Presto is packed with brilliance and momentum. This is an ingenious movement. The composer referred to it as “seven variations in search of a theme” and his novel approach to symphonic form allows him to write with apparent freedom yet the movement is cogently constructed. All sections of the RLPO offer expert playing. We get a chance to hear separate sections of the orchestra in the next two movements. In the second movement the wind and brass tackle their music with evident relish. The playing here is incisive and characterful. Then the strings are to the fore in the Cavatina. The rich, warm tone of the Liverpool cello section at the start is a delight. The movement as a whole is eloquently done and it’s perhaps no coincidence that a violinist is wielding the baton. It’s in this movement where the greatest difference arises between Manze’s interpretation and Handley’s. The latter is a little bit swifter in his pacing and brings the movement in at 7:50 compared to Manze’s 9:03. Both readings seem to me to be highly successful in their own terms. In the finale, if I may paraphrase the composer, all the 'phones and 'spiels known to the RLPO’s percussion section have a field day. The performance is high-spirited and most enjoyable. I’m certainly not about to discard my CD of Vernon Handley’s performances. They are in no way superseded; rather, Manze’s new accounts complement the Handley readings and might be said to refresh the RLPO’s Vaughan Williams tradition. The 1992 EMI recordings still sound pretty good. However, the new Onyx recording, engineered by Phil Rowlands and James Walsh has more impact and presence and I prefer it. This is a most auspicious launch for Andrew Manze’s Vaughan Williams cycle; I’m only sorry we shall have to wait until 2017 for the next instalment.